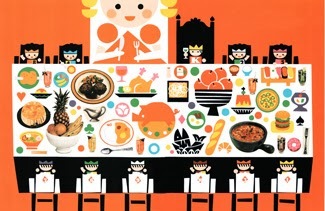 Yeah, The Tiny King by Taro Miura, first published in Japan, is a kind of weird book that just might be as crisply and colorfully straightforward and clean-cut as its illustrations. And I think that's just fine. Not every picture book has to have a deeper meaning that teaches a lesson. Some books stick with you, well into adulthood, and not always for the reasons you think they should. 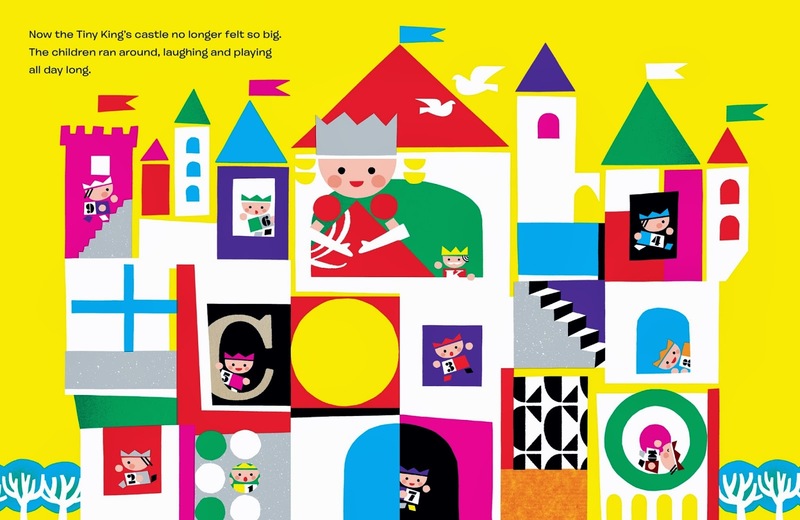 With a simple story and out of the ordinary geometric collage illustrations, The Tiny King is one of those books that stays with you. The story that feels familiar and comfortable, a bit like a fairy tale. A tiny king (as the cover notes, this IS the actual size of the Tiny King) lives in a very big kingdom where, despite his riches, he just can't enjoy himself. There's too much food at the table, his horse is too big, and his bathtub is too big to enjoy on his own. So is his very big bed. Most nights he is so sad and lonely that he doesn't sleep well. The background on all the pages for the lonely Tiny King are black, emphasizing the emptiness of his life despite the many soldiers who guard his enormous, building block-like castle. Then, one day, the Tiny King falls in love with a big princess and asks her to be his queen. Soon, there are lots and lots of children and the happy Tiny King sends his soldiers home to be with their families. The dinner table is always full and plates are always emptied now and bath time is "a real riot!" 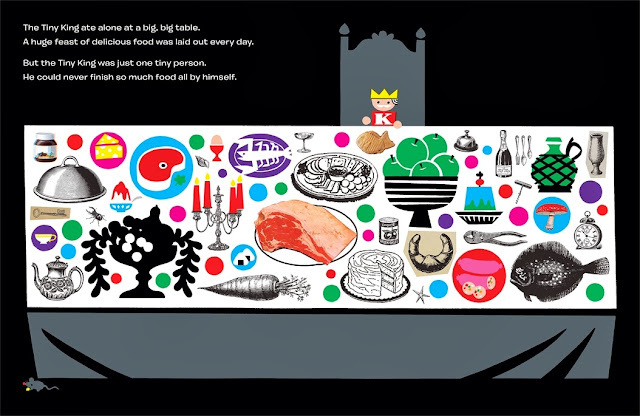 This illustration is hilarious and I wish I had it to share here, but the big Queen, the Tiny King and the little kids are so silly and strange that you can't help but laugh and enjoy yourself almost as much as the Tiny King. And, I guess if you really feel the need to tease a moral out of this story, it can be that companions are more precious than possessions as well as the old saw, "the more, the merrier!" Thinking about books and things that grabbed my attention as a little kid and seem somewhat strange in this day and age, here is a favorite old Sesame Street clip that I will never forget. Enjoy!